Lyte (dot) Org: Looking For A Team To Support? Looking For A Team To Support? Are you looking for a team to support in this year's Dakar Rally and don't know which one to choose? 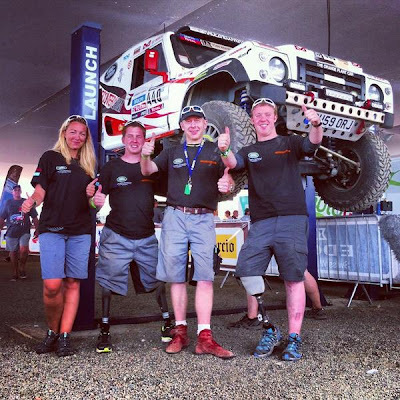 Look no further because this team deserves the support; Race2Recovery. Race2Recovery is a charitable campaign which aims to fund raise for wounded service personnel and their families. It aims to inspire seriously wounded ex servicemen and civillians alike, proving what is possible with determination and cooperation. It will consist of training, advocacy and fundraising events, the most significant of which will see a predominantly injured forces and ex-forces rally team compete in and complete the 2013 Dakar Race, universally regarded as the most gruelling and dangerous rally raid event on earth. I know that I will be following their progress and supporting this team from start to finish in the Dakar Rally this year and every year they participate from here on.